This beautiful girl is Cleo. At first glance she looks like any other cat you might see wandering around your neighborhood, but I assure you she is not. She is a member of our local TNR colony and she is appreciative of the assistance she receives. I know this by the way she interacts with us and the trust my roommate and I have developed with her over the years. At this point you may be wondering… What is TNR exactly? TNR or Trap-Neuter-Return (A.K.A. Trap-Neuter-Release) is a program where free roaming or feral cats are trapped sterilized and returned to the exact place they were initially trapped. The local program here in Arizona tips the left ear (the vet slices a very small piece off of the top of the ear leaving a flat edge instead of the natural curve) to help identify the cat as a previous TNR participant. I had concerns about this procedure at first, but I have been assured by veterinary professionals that it does not hurt the cat or cause any lasting effects other than the visible identifier. It is done while they are under anesthesia for the sterilization surgery. What it does do is to help easily identify previously trapped cats so caregivers can release any cats unintentionally trapped again during a future trapping. Okay, so what is the benefit of this program overall? The benefit is to stop the cats from breeding more kittens which lessens the amount of cats on the streets suffering. Normally they suffer from lack of food, health issues, get hit by cars, or are abused by callous uncaring people who have no respect for life or compassion for their plight. Many of the cats hit by cars are because they have an urge to breed or eat and will venture further away from their safe zone (I use the term loosely) to satisfy those urges/needs. Sometimes they are even pushed out of their colony because new scrappier arrivals are hungry and will challenge them for their place within the colony hierarchy. Where do these cats come from? Ironically, well meaning people feed strays and ferals they see on the street or who appear in their yard in need of safety or food. The problem with that is that if you don’t sterilize the cats and prevent them from breeding further, you are only contributing to the problem by creating an environment that supports their ability to effectively breed more kittens. Don’t misunderstand me, I’m not advocating letting them starve. I’m making the case that by feeding them, you are taking on the responsibility of preventing more suffering by being a responsible and compassionate person and getting them fixed. A lot of the colonies start because irresponsible cat owners allow their cats to go outside and interact with other neighborhood cats. Many of the cats were dumped by horrible, or ignorant, people who think they can just fend for themselves on the streets. Sadly, a large percentage of dumped cats just die on the streets from one of many dangers they face. That first generation of cats may or may not trust humans (depending on the abuse they endured), but their offspring do not. Like any other wild animal, their instinct prevents them from ever completely trusting humans and many exist out of site or are only seen when they come out to eat. 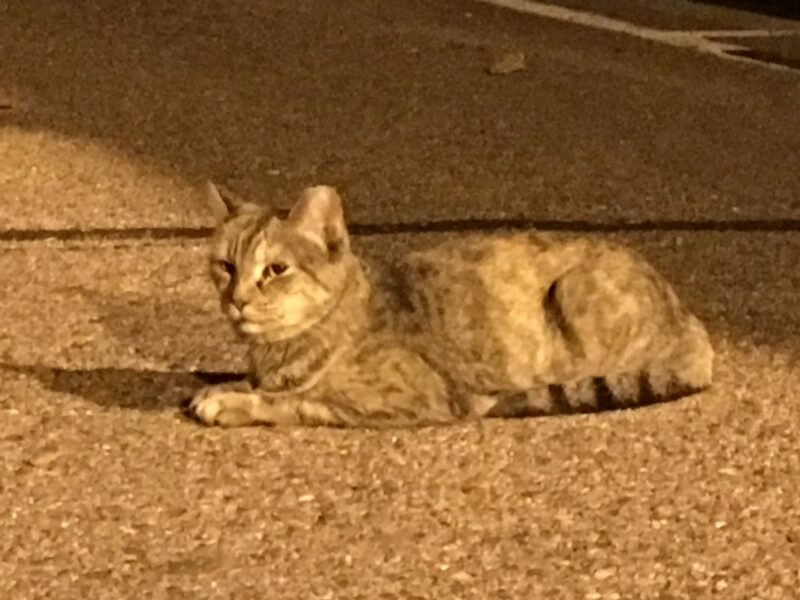 Here in the Arizona desert, we only see the ferals at night during the summer because it is just too hot for them to be out in 110+ degree temperatures. Depending on where they are at here and other places in the world, they face other challenges like lack of access to clean drinking water, bitter cold, predators, fights with other cats, and of course hostile humans. Why can’t these cats just be removed from the streets? Unfortunately cats who have never know human contact, are rightfully scared of us and after about 6 months of age can’t be domesticated. I know there are a few exceptions out there, but as a rule they don’t adapt very well, or at all after that age, to domestication. The best you can hope for is that you build enough trust with them that they come regularly for the food, meow at you, and hang around you. If you try to pet them though, they will usually bolt immediately thanks to their natural instinct for fight or flight. The ones who were handled and cared for from the time they were kittens are usually the most trusting of their human caregivers and may even brush up against your leg. Sadly though, most have never known any human touch or love. Some people advocate euthanasia or think a colony can just be relocated. Aside from the fact that killing animals is a moral dilemma and unacceptable to most of us, it just doesn’t work anyway. Generally it just creates a vacuum effect and other cats wind up moving into the territory. Cats are very territorial and generally a stable colony prevents new arrivals from moving in. Does it happen anyway? At times yes. That’s why colonies need to be monitored and if new arrivals are seen, a new round of trapping must be done to prevent the cycle from restarting. As a rule though, TNR dramatically slows down the explosion of new cats and stabilizes neighborhoods, reduces fights, and reduces overall suffering. Cats are also very effective at combating rats and other infestations. So if you or someone you know is feeding outdoor cats, but not participating in TNR, I can’t urge you enough to look into your local programs for TNR. Many programs are available through animal welfare groups, shelters, local governments, and some Veterinarians who offer discounted services for feral cats. Many Veterinarians will not even see or care for feral cats, so be sure to learn about what’s available in your local area by contacting your local animal rescue groups and a few shelters. Here in Arizona, they even target specific problem zip codes with free services. A local group even loans out traps to caregivers who agree to continue feeding the cats after they have been sterilized. What about the domesticated cats that were originally dumped? Like I said, most street cats don’t survive very long out there for a variety of reasons. My roommate and I have several cats that came in from TNR, but you have to be careful not to expose your other cats to things like Feline Lukemia. In fact, I lost one of my all time favorites to that this last year because he became too sick and I was advised that once they crash, they can’t be brought back. His name was Cosmo and he was clearly not like the other cats that we had trapped and placed in our laundry room the night of trapping. Cosmo head butted the cage door in a way that I knew he had previously been somebody’s cat. 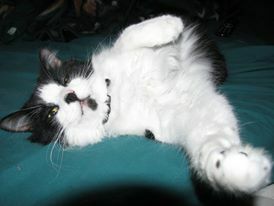 When he came home from the spay & neuter clinic, I just didn’t have heart to release him back outside. He was a mess with a matte of fur the size of a golf ball on his back at the base of his tail and he was the most filthy tuxedo cat I had ever seen. He was very scared at first and even scratched me pretty good when I tried to get him to come out of the litter box area where he took refuge upon release from the cage. But in a very short time he became fiercely loyal to me and would not leave my side when I was recovering from open heart surgery in 2011. He was the sweetest boy and never started fights with the other cats. You could just tell he always appreciated being here with us and showed affection to everyone. How anyone could have ever dumped him is totally beyond me. I miss him to this day! Spread the word to everyone you know about the importance of this program. Look into local programs in your area and donate any needed supplies or money to help support the programs. Most programs are on a limited budget and do what they can, but they always can use more help. If you don’t have money to donate, please consider giving your time by volunteering at a clinic doing intake, transport for people who don’t have access to their own vehicle, or even help disabled and elderly people do trapping. I assure you it will be one of the most rewarding experiences of your life knowing that you are directly helping to reduce suffering in the world. I dare you to look into the eyes of even the most feral of cats and not see one of your own previous, or current, pets in them. If your area does not already have a program in place, then form a group of like minded people and get something started in your area. Helping innocent animals to have a better life, even if it’s just providing them with food, water, or shelter on your patio, will make you a better person and will do your heart good! I enjoyed the article and think this is a great cause everyone can get involved with no matter where they live. Thank you for sharing! Cleo looks like my Dora. Dora was born in my closet to a cat that appeared in our managed colony one day that was obviously a pet cat. My other house cats (females) are all TNRs that decided to change their ways by the time that they had cleared their recovery time. Well, one is more a house feral, but she loves the dog so much that we didn’t have the heart to kick her back outside. We have had a few adults that were absolutely wild feral, until through mishap or medical emergency we absolutely had to handle them for life-saving treatment. All of them decided being a house cat wasn’t so bad, and all but two went one to happy forever homes. The two were not able to be saved, but we made their last weeks on earth much more comfortable, and they enjoyed being loved on within a relatively short time. Thank you for sharing your TNR story Mary! We have another one in the house (Jasmine) who came in after getting trapped/injured in an old swamp cooler outside, but she runs hot and cold on wanting human interaction even a couple of years later. She still spooks very easily unfortunately. Thank you for your support James!